FACT CHECK: Did Sarah Huckabee Sanders Wear a KKK Halloween Costume in 1993? "Coming from five generations of Ku Klux Klan members, 58-year-old 'Ms. Ruth' sews hoods and robes for Klan members seven days a week." 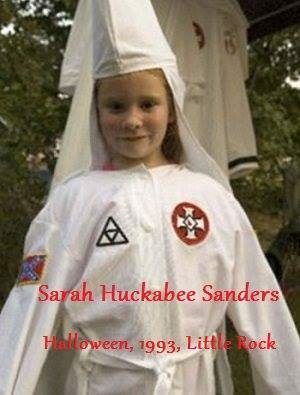 A photograph shows Sarah Huckabee Sanders wearing KKK robes for Halloween in 1993. Not only is Sarah Huckabee Sanders not the girl in the photograph, the image has nothing to do with Halloween, is not from 1993, and was not taken in Little Rock, Arkansas. Coming from five generations of Ku Klux Klan members, 58-year-old “Ms. Ruth” sews hoods and robes for Klan members seven days a week, blessing each one when it’s done. A red satin outfit for an Exalted Cyclops, the head of a local chapter, costs about $140. She uses the earnings to help care for her 40-year-old quadriplegic daughter, “Lilbit,” who was injured in a car accident 10 years ago. Here is the original caption and photo (this one was taken at the same time as the one you sent, I just can’t access all my files at the moment). 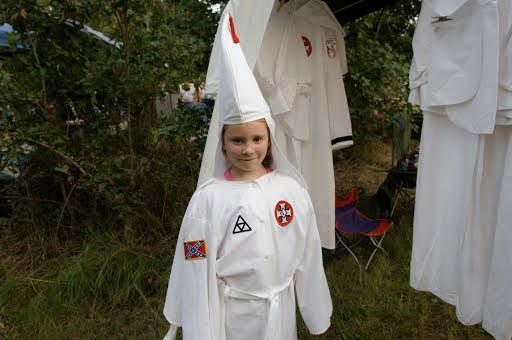 No, it is not Sarah Huckabee Sanders and that child was, in fact, a member of the Ku Klux Klan at the time. Sarah Huckabee Sanders was approximately 25 years old when these photographs were taken in 2007. We’d argue that the actual problem is that fake photographs are being shared with false claims in order to amplify the echo chamber and reinforce preconceived (and often erroneous or inflammatory) beliefs. Arkansas Online. 15 October 2016.